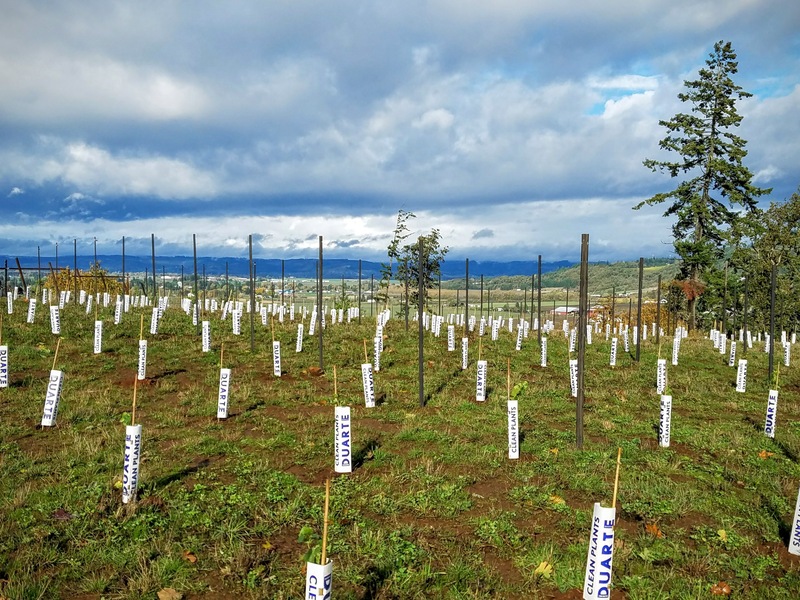 Input – Getting a vineyard started – Oregon / Amity-Eola Hills AVA Growers, if you are so inclined to provide input on starting a vineyard in the Amity / Eola Hills area, please contribute. The comments will be moderated, but I will post them after I see them.. Your name and email are now required to comment due to spaning, If you provide your email, it will not be public and will not be disclosed. Take the class at Chemekita – I’ve heard this from every one we’ve talked to..
Don’t rush into it, take your time, get involved and ask alot of questions.. Note: after talking with many of the vineyard owners in the Eola Hills area, Deep ripping is not needed. Generally (unless there are huge rocks directly below the surface) the vines will find a way. You might save a lot of money (rip+mess cleanup+rocck removal) by just not doing it.. However, if you do, deep rip should only cost you a few hundred / acre (shop around), but if you have a lot of rocks you’ll end up with a mess. With deep ripping you’ll bring alot of these rocks up to the surface. Either way, if you’re going to plant anchors and end posts, have those cleared as best as possible. Note: You may not need to deep rip for grapes. If you add that up, it’s not cheap :-). don’t forget Power and Water. Bottom line, plan your land purchase accordingly. It started long before we purchased the property in 2015. 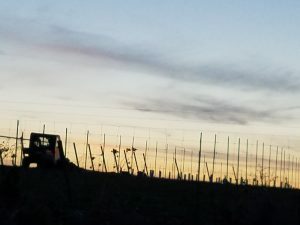 I’d been making wine since 2001 and working off and on helping out at a winery off North Valley Rd. in Newberg. My sister is also a brewer and had started building a Micro-Brewery (more like a pico-brewery) called Ironwood Brewery in Valporasio Indiana. We started looking for property in 2013. It really did take us 2 years to find something that we thought was a good match, affordable and met what we felt was the market price. We’d seen alot of property that had been sitting on the market for a long time and it was over priced. With Measures passed to allow property to be sub-divided to 5 acre parcels we looked at many 5 acre parcels in Yamhill county. Many of them were perfect but most were sitting waiting for someone who had a lot of money and didn’t have a good understanding of the value of land. (lesson learned – spend time figuring out what is a good market price) I’ll also tell you a realtor is not much help here. 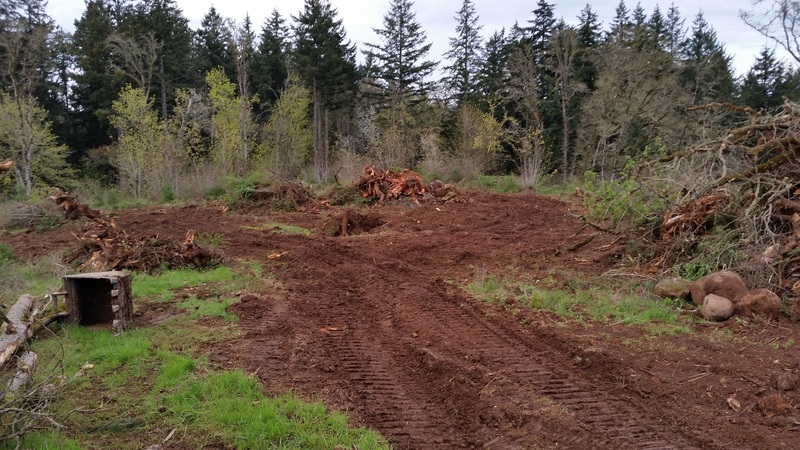 We loved our realtor and wouldn’t have done it without them, but we ended up having more insights on un-developed land after looking for 1 year than they did. 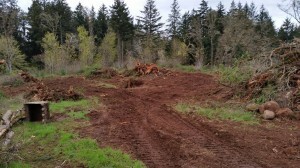 We found the property after doing a organized bike ride at Stoller’s. Mary had been with her “bike bunch” ride on the Wednesday before and they climbed up Eola-Hills Rd. She and the bunch rode by it and said we should go look. We did and here we are. 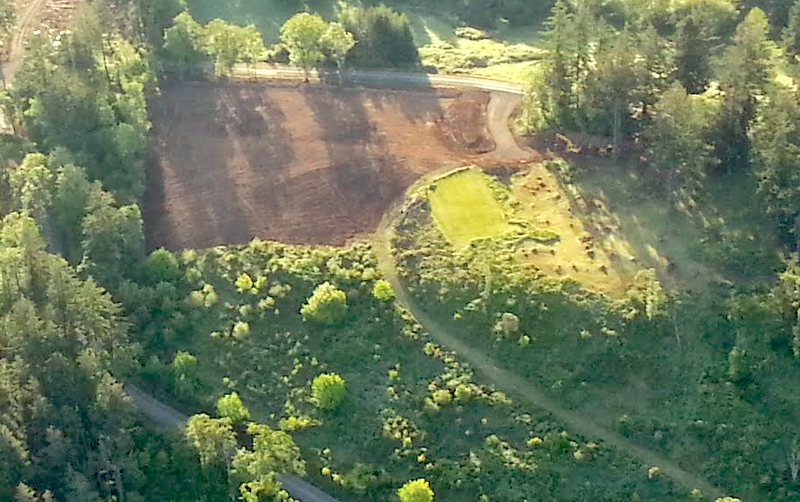 We did a lot wrong and I can tell you so far it’s worked out ok, but as of the first two acres of land clearing (April, 2015) there is a large list of things we’d do different :-). Take the Chemeketa Vineyard Mgmt Class. It’s not cheep but a couple key take aways. You’ll quickly realize this is not a cheep deal, and there is alot of up front $$ that need to go into it. If this scares you good, You should be. The General Viticulture class makes you go through a high level business plan. You’ll probably need a well. Get a list of wells and their depths by going to the county and finding the depth of the wells around you. (ours are around 400′ — outch). We did not do this. Power. How close is power and what will it take to bring in a 320amp service? Let’s talk dirt. Excavation is not cheep. I don’t care what you read on the internet, so far, between a well and excavation this has been our biggest surprise. 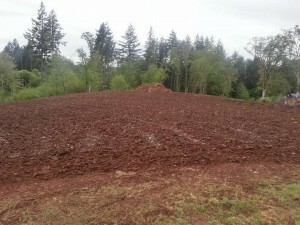 If you have rocks it’s alot more than one would think, drop by and we’re happy to share our experience here (just for the 2 acres we did). Pick a good excavator and find references. Question them all and don’t be afraid to let them go and move on down the list. The well. That was the next task. Get water. We struck water, but you’d a thought we were looking for oil. 477′ later we had a well. I have to say our experience with finding water was excellent, all be it expensive. We were prepared for this given the depth of wells around. The well drilling company we chose was excellent. They set and delivered within expectations, so all in all (other than the empty check book) the experience was good. With 2 acres clear’ed and 8 more acres of grass, rocks, trees, brush, blackberries, poison oak and Canadian thistles we quickly realized that a tractor with implements would be a requirement. We found that renting was not all that bad. For about $300 you can get a mower/brush hog and box scrapper. At some point you’ll also need a tractor based sprayer to stay on top of the weeds in the field. 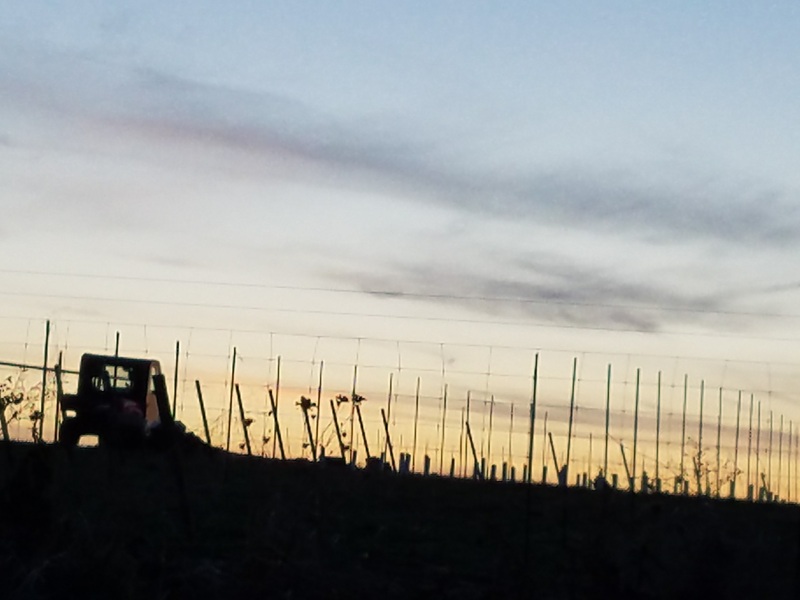 At the end of the day we picked up used tractor from our local Vineyard supply store in McMinnville. Great folks and we plan on working with them for years to come. By the way, tractors are not cheap either. :-). Ok, well in, tractor purchased.. some other near term things start popping up on the list. Well house. Also.. Power.. It’s July and we’re running out of $ and time. That 500′ hole has water, but you got to get it out and pump it. You’ll need to store it some where and the pump needs power to get the water out of the hole. 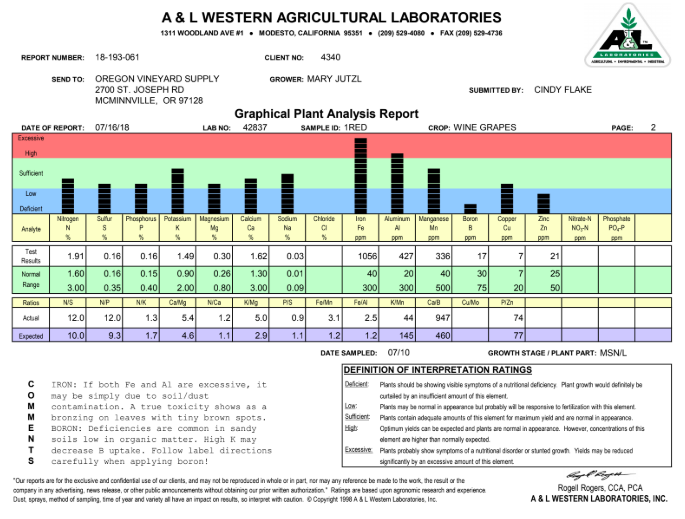 Field prep – lime an nutrients based on soil analysis..
the vines from a Nursery and they were delivered after we fenced and put in all the end and in-line posts. Given we have a small tractor and a brush-hog the 7′ rows would have saved us a second mowing pass, but we ended up buying a riding mower (Deere) and it would have been two passes either way. Grow Tubes – We used the carton grow tubes, but ended up within 3 weeks with PM. (lots of it). We also heard two sides to this. Some are believers in Grow Tubes, others are not. We ended up pulling them off since they were full of spores. We burned them and left them off all winter. We put new ones back on in February after we trimmed to 2 buds. 2017 started out cool, so it got the plants started nicely and helped with spraying, but come May, the smaller diameter grow tubs started burning the plants in the 90dF temperatures. We pulled every other row to see what would happen. Ask us and we’ll tell you what the results were. Spraying – For cleaning within the rows, 2 sprays in spring appeared to have done well for keeping the rows clean. We sprayed out about 1 foot from the plant row and between plants. The second spray was really mostly a clean up. 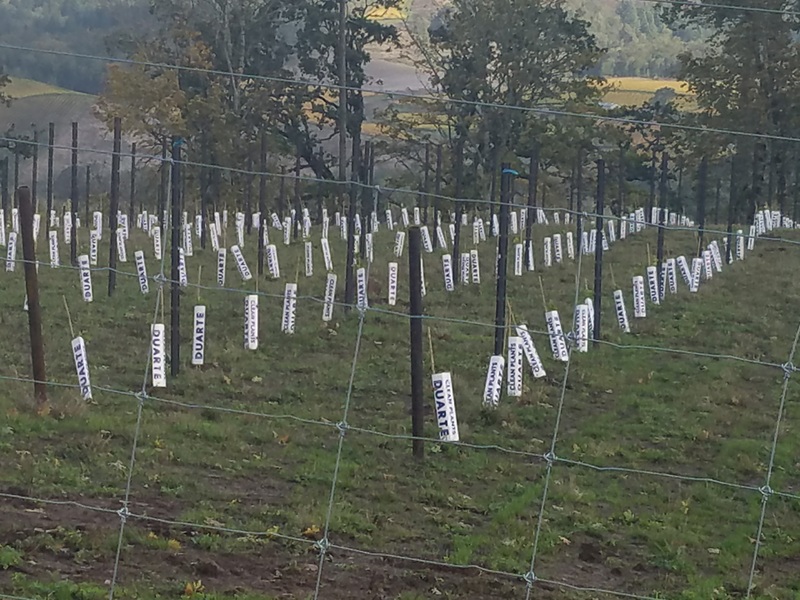 Trellis (pre-emergent) was recommended to be added to the Glyphosate, however the cost is was a bit too much. Lots of varied input regarding 1st year spraying and we’re still trying to work it out. The plants weathered great. We had a very dry spell last August and the Wadenswill clone did not do well. Tip #1 look at the forecast and if you see a long stretch of very dry and HOT weather get in front of the curve. Those stomas close in the 90’s. With limited water the vines get a bit stressed. https://grapesandwine.cals.cornell.edu/newsletters/appellation-cornell/2016-newsletters/issue-26-august-2016/grapes-101. Best to water a few days before the heat wave hits. With closed stomas those plats stop up taking water. Replace lost plants when you prune. Do it early and don’t wait. I threw some 16.16.16 fertilizer down on the base of the plants, but don’t do this with the grow tubes on. The new plants we stuck in the ground had grow tubes on them and they got a bit of burn from the 16.16.16. We 2 budded again the second year and we put the Fruiting Wire up in May and so far so good. Much like the Grow tube controversy, the fruiting wire hardware is another one of those things that can go many ways. 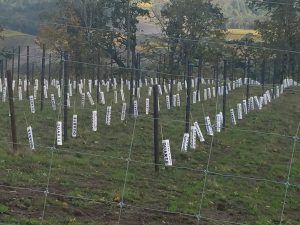 We have 2 inch oil field pipe and that wire will slide right down the end post if you don’t do something to keep it on post, however we were told by our local vineyard supply store that Grippels and a a frictction tube should work. One thing you will need is a Wire Spinning Jenny. $60-$90. Buy one or barrow one. It s a must have. The Vineyard supply store sold hi-tension wire in 100lb rolls (about 3600 feet). We needed 2 for our setup. I purchased the contractor’s gripple tool since the cheap one looked like it would break after the first few rows and I wasn’t about to stop mid day and have to shuttle back to the store to by the better one. It was a little over $100 but worked very well and I’m sure I’ll be using it again in the future. When you get to the far end-post, I simply did a 360 wrap around the end-post. I marked the height with a pencil and centered the loop. When I snug up the starting end, that loop will close about where it needs to be. You can position it (with alot of work) a bit better if you’re off a bit. Below shows the loop closed and positioned. For the end you snug up, I used a bamboo stick to position the wire. I’d recommend a 2×4 but at the time I didn’t have access to a 2×4 and a saw. Loop it around and feed it and the tube around the end post. I held my leg under the wire to snug the gripple. And after it snugged up a bit I positioned the stick at the proper hight and snugged it tight. I tried a variety of things (if you visit you’ll see). I’m going to go back and get pipe clamps to put under these ends to ensure they do not slip, but they appear to be quite solid without them. Our in-row posts have notches at 26″ and 33″. Since I didn’t tension the fruiting wire too tight, I can move this up next year to 33″. In May (when we put up the wire) the vines were starting to lay down with the weight of the canes. With the wind, this was causing some of the to break, so I needed to be able to tie them up to the wire. Potassium Challenges… or… is it Boron? Our first real challenge in the vineyard. Other than keeping the plants hydrated, we’ve put about 1/8 cup of 16-16-16 on each plant. With 5×8 spacing on the Acre+ that turned out to be 5 bags per application. All looked good. We fertilized in Late April and May. June of 2018 was super dry so we did some hand watering to keep them hydrated. One thing we noticed Mid July was red leaves at the base of a few plants. This Caused us some concern. Asking around we discovered we should just take a few leave samples to OVS. They can send these in and get them analyzed. So we did a random sample across what we thought the healthy plants were and a small sample of the plants (only a handful) that appeared to have a problem. Doing so, OVS was very helpful in suggesting that this is probably a Potassium deficiency. Digging in there is not much you can do in July/Aug/Sept other than foliar spray which has a very limited effect. So the plan is now to spray every 2 weeks to give those 2nd year plants some nitrogen and potassium and hit it with Fertilizer in Fall and Spring…. or is it?.. hold it.. the report is in. Here is the report .. So it is Boron… (or it appears to be 7/17/2018) Got more to add when I hear back from the local growers on Eola-Hills..
… And here it is. Based on growers in Carlton and Eola-Hills, Boron deficiency is common and most everyone sprays with Solubor. 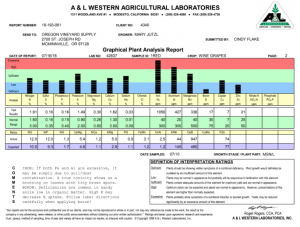 Feedback from one of the growers looking at the image of the plant indicated that it looked more like a Potassium issue than Boron, but regardless he also indicated that Boron deficiency is common in the Valley. Eola-Amity Hills AVA meeting right next door to you at Bella Collina (a new B & B) – 6280 SE Eola Hills Rd, Amity OR 97101 at 5:30 pm, next Wednesday, January 10, 2018. You will meet most of the neighbors who farm in the area – a very friendly and cooperative group. 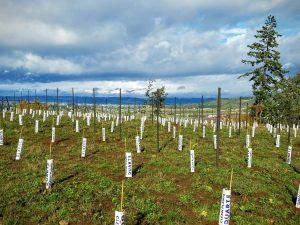 Also highly recommend that you attend Oregon Grape Growers Group – very informal and very helpful. Meets the first Tuesday of each month at McNary County Club in Keizer from 6:00 to 9:00 pm. This month they have moved the meeting to Tuesday the 9th. So, you can attend two VERY informative groups in two days next week. 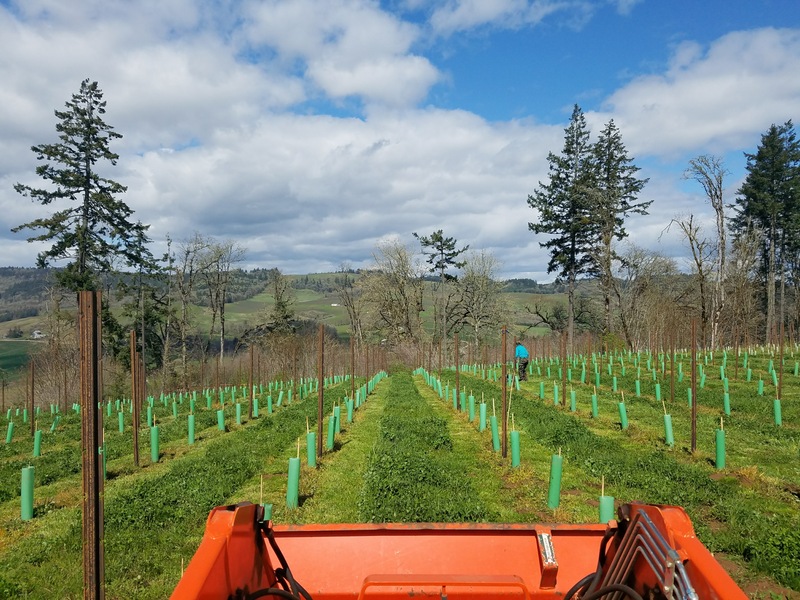 My rule of thumb has always been $30,000 per acre for the first three years (until first harvest) for small (under 10 acre) vineyards. Think you will be happy with the 8 foot row separation.